Source: Purchased at Barnes and Noble. Gertie Johnson has an investigative service she calls The Trouble Busters. Problem is, The Trouble Busters have run afoul of the law. Just a little thing called obstruction of justice, you see. Ordered to perform community service, Gertie and her gang wait until the last second to pack into the vehicle and head for Applegate Senior Living, an assisted care facility nearby. A bad snowstorm is headed their way, but Gertie is certain that they can put in their full day of community service. If they don't get this done, they'll all be behind bars come the new year. Grandma Johnson is hoping to kindle a flame with Earl (one of the Applegate residents), Cora Mae is prepared to do a shampoo and set for anyone who wants one, and Kitty's going to make sure that all the residents have every bit of legal advice they could possibly need or want. Of course with this gang, nothing is going to run according to plan, and you know they're going to stumble over at least one body and one person up to no good. If you've never read any of Deb Baker's Gertie Johnson mysteries, this novella is an excellent place to start. 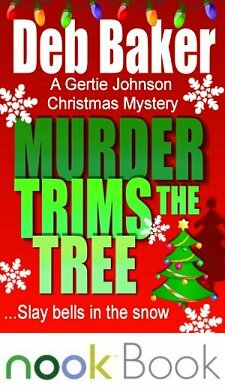 If you're already a fan, you're going to love Murder Trims the Tree. It's fun to try to piece all the clues together as to what's going on at Applegate, the characters provide plenty of laughs, and there's plenty of holiday spirit. Plus the length is perfect to start a new holiday tradition of reading this story aloud on Christmas Eve. How can you resist? Murder Trims the Tree at Barnes and Noble. Murder Trims the Tree at Amazon. Cathy - This certainly sounds like a nice, light, fun read. And it's interesting that there aren't as many novellas as there are longer novels. Thanks for sharing this. This sounds perfect for this time of year! The book sounds like fun and it's short enough to keep one's attention during this busy season. This one sounds good, but I have read two rather disappointing cosies recently, so now I need a change of diet for a week or two. I think that with the ebook, we will have more novellas. It is probably too expensive to publish so short a paperbook, but ebooks encourage flexibility - or at least they should. Margot-- I think publishers have more to say about the availability of novellas, don't you? Kathy-- Yes, it is perfect for this time of year! Dorte-- Yes, they *should*-- and I hope that they will. With more authors self-publishing, I can see this happening. The only problem will be in marketing all these goodies.